I recently had one of the coolest experiences of my life when Disney/Marvel flew me out to LA for the premiere of Thor: Ragnarok. If you didn’t get the memo, the film that’s being called the best Marvel film ever hit theaters yesterday. I strongly encourage you to see it this week. It is INCREDIBLE! You can see my spoiler-free review of it here. As part of the press junket that I attended, I was fortunate enough to get a few really good interviews and attend the media press conference. I also had the chance to check out some of the new Thor: Ragnarok merchandise. This is my Rachel House Interview. Thor: Ragnarok is in theaters now! Rachel plays Topaz in the film, a character who stands as the right hand to the Grandmaster (Jeff Goldblum). She is portrayed as a brute warrior with a comedic character. In Marvel comics, she is portrayed as a powerful magician with an interesting and unconventional past. Without spoiling her role in Thor: Ragnarok I will say that she plays one of the smaller roles in the film, but adds a funny dynamic to the story and opens the floor for the development of the Valkyrie’s character. I would love to see more of a backstory on Topaz played out in the MCU. While the movies often tell different stories, I’d love to see how they would adapt her original story. Looking for interviews? Check out my interviews with President of Marvel Studios Kevin Feige, Director Taika Waititi, and Karl Urban (Skurge). Rachel was a delight to interview. She has a bright smile that lit up the entire room when she walked in. She seemed very excited to meet bloggers and had loads of great things to say about the film, working on set and working with her friend Taika Waititi (Director). Rachel has worked on all of Taika’s films. They have been longtime friends (which she talks about in this interview) and he always makes a place for her. I think that is awesome when friends can work well together. In this interview, Rachel Talks about joining the MCU, her take on Thor: Ragnarok and Korg, her longtime friendship with Taika, working with Taika, laughing a lot on set, Moana, and cutscenes. Joining the MCU is a huge accomplishment for any actor. And with great accomplishments come intimidation and pressure. So how did Rachel handle joining the MCU? Here she tells us about getting comfortable with her new family. Of course, it was intimidating stepping into the Marvel Universe, but you get over that really quickly. You know, when you meet people, there are so many wonderful people involved in the Marvel Universe, and just meeting them… they’re just people. They’re just normal people, talented people. So yeah, the intimidation didn’t last long. The night before the interviews and press conference was the Thor: Ragnarok premiere. It was also the first time the cast had seen the film. I’m still a little tingly over the idea that I got to see this epic film with the cast for the first time. There literally are no words to describe how cool that is. Rachel talks about what she thought of the film. It was great! It’s so Taika. It’s so full of comedy, and his unique brand of humor. And Korg was so great. It was amazing. And, you know, people back in New Zealand are just gonna fall about, because it’s such a familiar character. You know, that character is very real. Much like the blogosphere, people in the entertainment industry revolve their careers around long-lasting relationships. Both are such competitive career fields that it’s impossible to go into it alone. You remember your roots, pay it forward to those who are working hard and give back to those who have helped you out. Relationships are imperative. Rachel talks about her relationship with Taika and how it let her to Marvel. I met him when he was 17. He was in a play in this little theater in Wellington, and he was the best thing about it. I was a couple years older, and at drama school at the time. At Wellington, I met him after and said, “You were so great. You know, thank you so much.” And then started becoming a fan of his little crazy comedy stuff that he’d do with Jemaine and Bret and another guy called Nigel Collins. And they had this really crazy little, just the most stupid sword fights with straws and reenact style wars. And, you know, that was their comedy. So, I became a very big fan. From then, we just kept staying in touch. And I mean, I had no idea he was gonna end up being an awesome film director. He was an artist, and an actor, and a comedian. Since Rachel has worked on all of Taika’s film in the independent vertical, working with him on a major Marvel film was clearly a different experience. Here’s what she had to say about working with Taika on Thor: Ragnarok. The fun of it is really good. This is the first major film he’s done. The others were very independent, therefore we had a very limited amount of time to shoot on other films, like five weeks. We had to literally run around the bush, and the mud, and the snow, and the rain. It was a lot of fun. But we had no time. So, we just had to keep going. 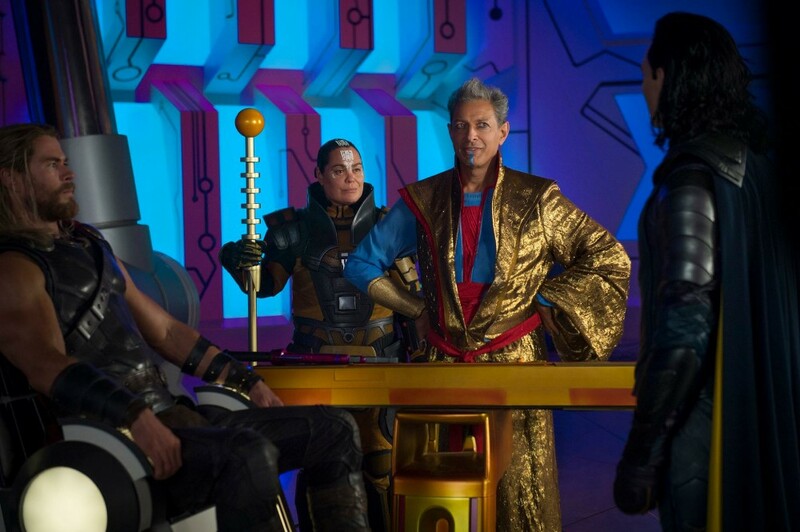 Whereas in Thor, because of the scale I think as well, we got to kind of breath a little bit, and Taika was allowed to play as much as possible. So, that was really great seeing him able to do that without any kind of time restraint. There’s a lot that goes into casting actors for major films like the ones we see from the MCU. So how did Rachel get cast for Thor: Ragnarok? Here Rachel talks about the auditioning process and how Taika brought her into the MCU. How did you first get approached for this film? I got a top-secret kind of audition that I had to do through my agent. She said, “Oh, it’s for Marvel.” And I said, “Well, that’ll be Taika.” You know, of course, it will. And she went, “Oh yeah, of course, it will.” Then I was given this tiny little saying with a few lines. And then I did a tape with one of my buddies, who’s a casting director and then sent it off. And then got a very kind of drawl email from Taika saying, “Oh, by the way, you got the role.” You know, which is really lovely. I don’t know if they saw any other people. I’m not sure. I think he kind of made it what he wanted to see me do, even though most of it hasn’t ended up in the film, but that’s okay. There’s better stuff in the film. Everyone loved Gramma Tala in Moana. We all laughed when she told stories and cried when she died. And when she came back in spirit to guide Moana through her darkest times, we cried even more. Rachel talks about what was it like going from Gramma Tala to Topaz. It was kind of easy-ish. It’s a kind of character that Taika always makes me play. It’s funny, ‘cause you know, I just play all these really mean characters, but I’m not mean at all. I’m sort of really ‘ooh’ about meanness. So, I think he kind of enjoys that. You know, I’m pretty used to keeping a straight face, ‘cause I’ve done a lot of Taika’s films it’s always like that. But some of the other actors weren’t so good at it. Like they were losing it, especially Jeff Goldblum, ‘cause he was so funny. You know, I mean, that’s not even half of it what you see. It’s not even a quarter of what the improvisations and stuff that we were doing, you know? And Jeff was just so masterful at improvisation. It’s no secret, it was mentioned by in both the Taika Waititi and Karl Urban interviews and in the press conference that there was a lot of improvising in this film. Taika was praised for it, and when you see the film you’ll understand why. Still, you can’t get everything into one film. Here’s what Rachel had to say about cutscenes. You know, there’s a lot, and I believe that they’re gonna do a little kinda gag reel maybe, with the release of the film. Taika was saying something like that last night. With regard to a scene, there’s a whole thing we do with writing out a check, which is so bizarre in that environment. You know I’m kind of giving instructions on how to write out a check in my stupid Kiwi accent as well. It’s pretty funny I think. But yeah, Jeff was fabulous. It’s just that little moment, you know, at the beginning where she’s kind of (we won’t say), we just had a mess. And it happened with the encouragement of Taika. But we just started doing it sort of naturally. Because we were kind of trying to out warrior each other. Tessa, she’s a darling. What a darling. She’s wonderful. And I felt so embarrassed because I watched Creed, and I said to her, “Oh, I loved in that boxing film.” I always forget names of things. And then I realized that I’d seen Dear White People like three times, ‘cause I love it so much. And she’s in it, and I had no idea when I met her I was like, “Oh.” So, it wasn’t until afterward where I actually Googled her, because I tend not to want to Google the people I’m about to work with, especially if they’re kind of famous you know, ‘cause I don’t wanna necessarily have that pressure, you know, feel intimidated. So, I didn’t do any of that. But once I realized it was her in Dear White People, I started Googling and seeing how much else she’d done. As you’ve read in the interview so far there are a lot of takes that didn’t make it into the film. Between all the laughing and improvising, there had to be some hard decision making. But one particular cut was from a moment with Jeff Goldblum that no one will forget. Rachel talks about this moment. There was this whole scene where Jeff does a made-up song at the keyboard. Right there. It was really cool. I mean, I think he had a tiny little bit to kind of go with, but then he just kept expanding. As you know, he is a wonderful jazz musician anyway. So, he just expanded that. I was sort of his back up, really bad back up singer as well. So, that didn’t make it in, which is a bummer. It was an absolute pleasure to cover this Rachel House interview. She was lovely woman and talent to meet. I’m very excited to follow her future projects with Taika. Till then, I’ll be crossing my fingers in hopes of seeing her in upcoming Marvel projects. Be sure to check out Thor: Ragnarok in theaters everywhere now! If you missed my SPOILER-FREE review, check it out here! Don’t forget to enter my EPIC Thor: Ragnarok giveaway with over $200 in prizes. Special thanks to Disney/Marvel for flying me out to attend this press junket. This in no way shaped my opinions in this article.